January 23, 2010 - In a true demonstration of the international support of the relief efforts in Haiti, U.S. Air Force and Federal Aviation Administration officials paired with a Russian airlift contractor on Thursday to deliver a mobile air traffic control tower out of Homestead Air Reserve Base, Florida to the Aeroport Toussaint L'Ouverture in Port-au-Prince. The structure will be used until a permanent facility can be rebuilt, according to FAA officials. The 7.0 magnitude earthquake that devastated Haiti January 12, 2010, severely damaged the airport's air control facility, rendering it inoperable. The government of Haiti asked the U.S. government to help with a solution. 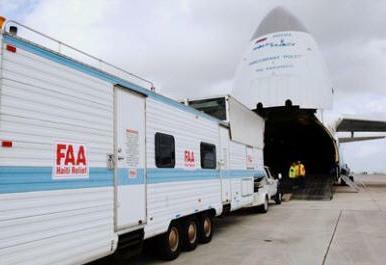 In response, the FAA produced a mobile control tower used for relief efforts following Hurricane Katrina in 2005, said to Angus Wall, the FAA Miami Technical Support Center manager. The 44-foot mobile facility features a design similar to a fifth-wheel trailer that can be towed by a truck. Standing 13 feet high and 8 feet wide, it contains all the equipment necessary to fully coordinate the international inflow of relief workers and supplies, Mr. Wall said. "By installing this air traffic control tower, not only do we give controllers a place to operate, but we establish communications with these other air traffic organizations," he said. "So we can coordinate planes taking off from everywhere from Juneau, Alaska, to Madrid, Spain, to Russia, to England." With improved communications, aircraft will flow in and out much more efficiently, he added. Only one challenge remained: delivering the tower to Haiti. Mr. Wall said the mobile tower has never been outside the United States. U.S. Southern Command officials coordinated for the FAA equipment and the aircraft to use Homestead Air Reserve Base, Fla., as the loading point. Because of the timing involved, the Air Force contracted the Voronezh, Russia-based Polet Airlines Cargo charter services, to move the equipment. The Antonov An-124 from Polet Airlines, the world's largest cargo aircraft, arrived at Homestead ARB, Jan. 21. More than 100 Airmen helped position the equipment on the flightline and assisted the Russian crew as they loaded the aircraft. Mikhail Trapeznikov, the An-124 flight manager and radio operator, said he and his team are proud to be a part of this mission. "We've done a lot of (humanitarian) missions," Mr. Trapeznikov said. "It's nice to be a part of it." In addition to the Air Force and Polet Airlines, other organizations such as the Federal Emergency Management Agency, the U.S. Agency for International Development and the FBI also contributed to the effort, Mr. Wall said. The mobile air traffic control tower will take approximately 48 hours to become fully operational and an FAA technical support team will remain with the tower until it's no longer needed.